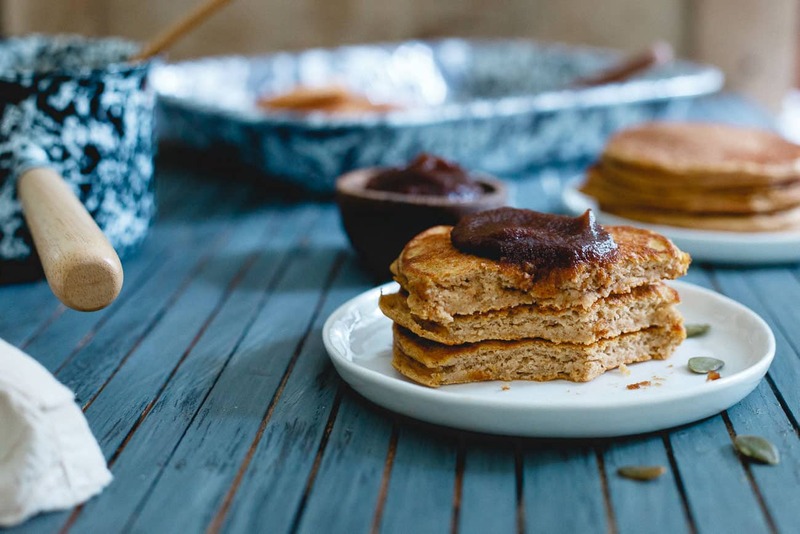 Note: This post for pumpkin protein pancakes first appeared on October 9, 2011. The recipe has been edited slightly and the photographs updated to match the deliciousness of this simple fall breakfast! Hope you enjoy a stack! 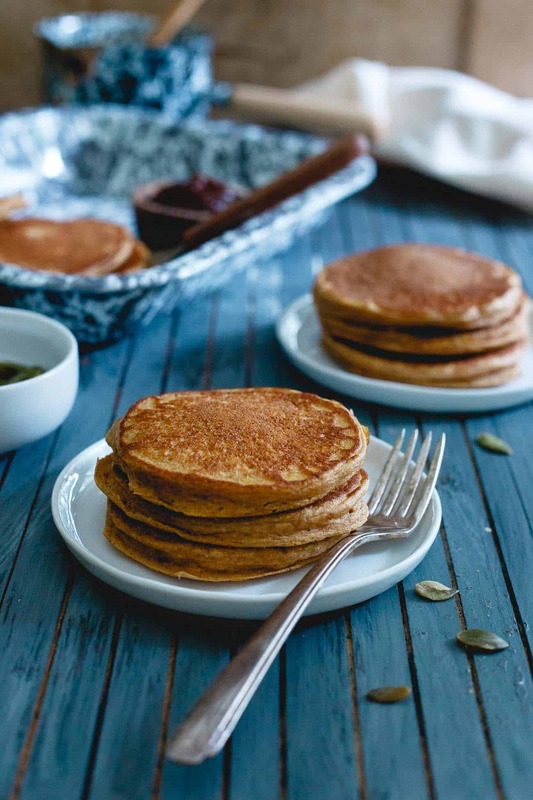 These pumpkin protein pancakes are a simple, fall recipe for pumpkin pancakes packed with protein (19 grams per serving!) to help keep you full longer. A healthy and delicious start to your day! Hope you are all enjoying the weekend! We are having amazing weather here in NY and I’m trying to soak it all up before mother nature decides to freeze us to death. There’s no better feeling than being able to shut of the alarm clock before you go to bed on Friday night and wake up whenever it is that your body decides it’s had enough rest. That was 8:53am yesterday and it was a.m.a.z.i.n.g. 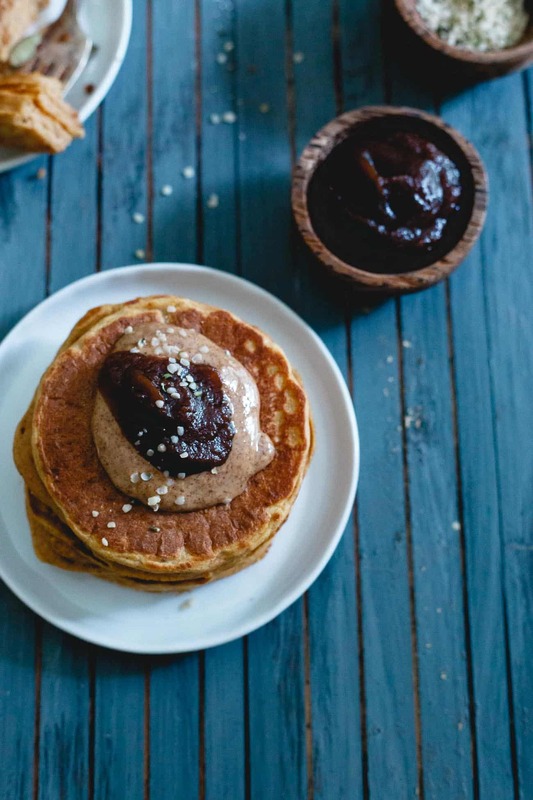 I took advantage of the lazy morning to try out some new coffee along with a new spin on protein pancakes with these pumpkin protein pancakes. After the pumpkin chocolate chip bars from earlier in the week, I had quite a substantial amount of pumpkin leftover. Usually, I end up topping my pancakes with greek yogurt and fruit, mostly for the added protein. I just wasn’t feeling the yogurt topping yesterday so I decided to make the actual pancakes packed with protein instead. 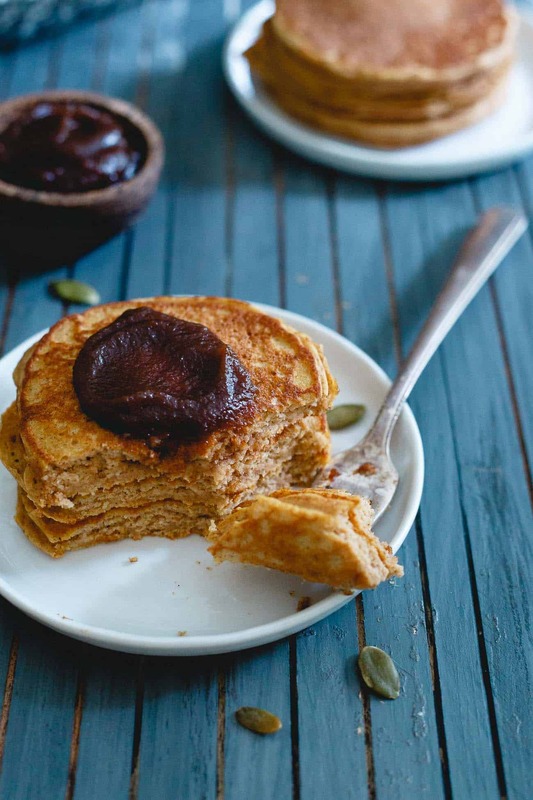 What’s In These Pumpkin Protein Pancakes? You can definitely substitute your favorite protein powder for the collagen peptides, they’re very similar and usually pretty alike in protein content too. An unflavored or vanilla whey protein powder (<– love this brand and always recommend their stuff) would work great. 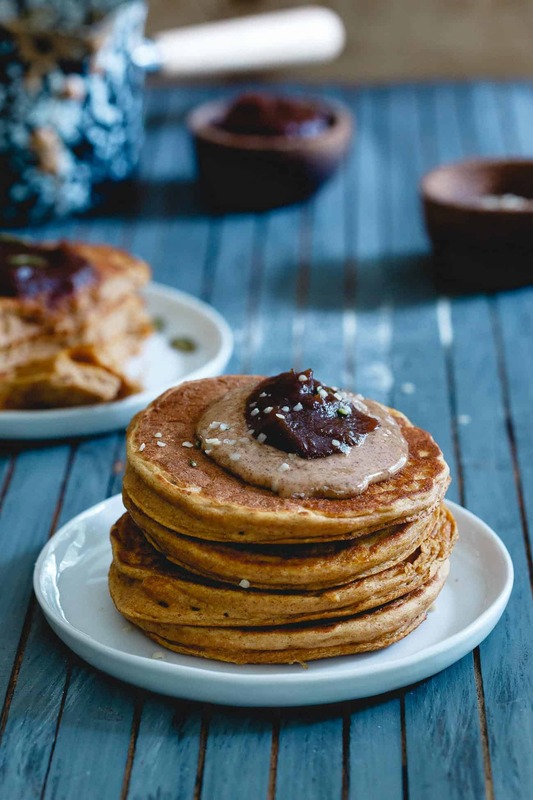 Then you’ve obviously got the pumpkin and all the necessary pumpkin spices along with flour and milk in this pumpkin protein pancake recipe. 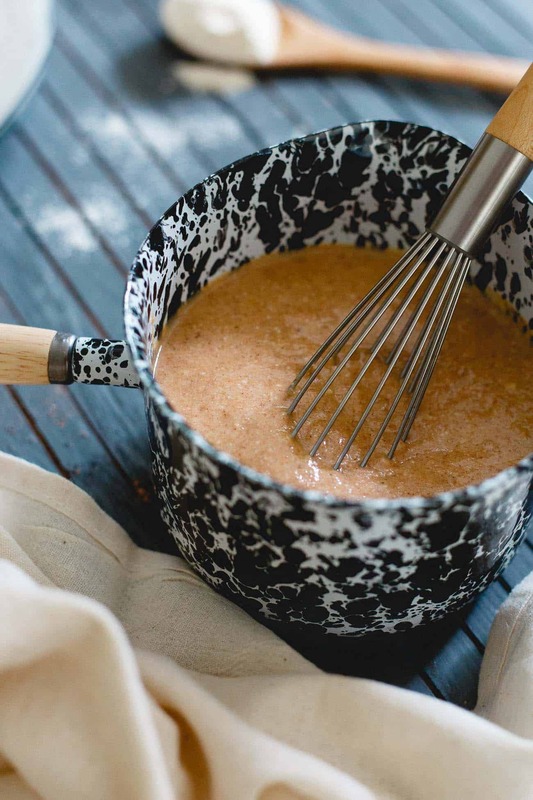 While I used regular milk and whole wheat flour if you need to make these dairy free and/or gluten-free I’m pretty confident you could substitute almond or oat milk and your favorite gluten-free all-purpose flour blend (I personally really like Bob’s Red Mill Gluten Free 1-to-1 Baking Flour). Fluffy and doughy at the same time. Pumpkin has a tendency to make things “cake-y” but somehow that didn’t happen as much with these as with the oatmeal pumpkin pancakes. I think the egg white had something to do with it. It bothers me to no end when recipes call for egg whites and not the whole egg. Organic eggs (much like organic milk from the pumpkin brownies) cost a small fortune and wasting half of it just irks me. I finally put on my big girl pants though and added an egg white to the batter. I knew it would make the pancakes fluffier and Ginger was quite excited for the yolk in her breakfast. Besides the taste and texture game being on point in these pumpkin protein pancakes, the protein content per serving is a whopping 19g. That’s equivalent to a solid 3 ounces of protein! Bonus: a good chunk of it is coming from the joint and skin miracle worker, collagen peptides! You can read all about the amazing benefits of incorporating collagen into your diet in this mango melon soup recipe. The best part of this breakfast though? Being able to enjoy it out on my deck in the middle of October. I wish we could just keep this weather until April! 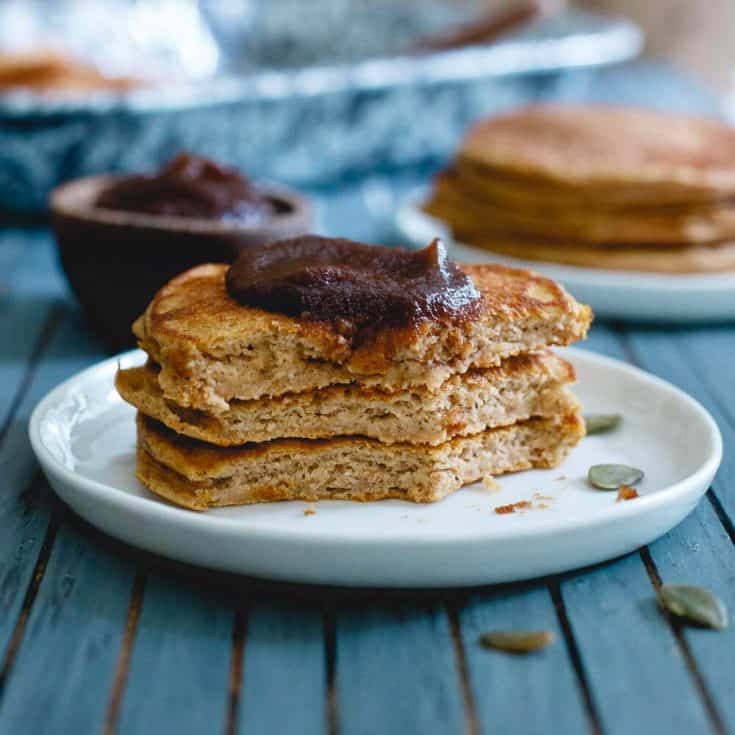 These pumpkin protein pancakes are a simple, fall recipe for pumpkin pancakes packed with protein to help keep you full longer. A healthy start to your day! Preheat a pancake griddle or pan to medium heat and grease. Add wet to dry ingredients and mix. Pour batter onto pan, cook approximately 1 1/2 minutes per side, or until fully cooked, flipping once. I am so scared to make pancakes. Isn’t that ridiculous? I’m just freaked out they’ll stick and burn like crazy. chocolate chips is the end all and be all for pancake add ins! Also, Pete’s coffee is awesome. Thats a lot of pancakes for not a lot of calories! looks like a winning recipe! The coffee and the pancakes both look really good! These pancakes look so amazing right now. Especially since i’m sitting in an airport, waiting to get on a flight. It’s 1am my time. I hate red eyes. but you knew that. Delicious recipe! Yogurt worked great in place of the cottage cheese. These pancakes were good! They have become my go to sunday breakfast staple. Thanks for the awesome recipe! They were amazing. I did greek yogurt and almond milk. Used chocolate protein powder and topped with a banana. Amazing! These were so delicious! Just made them this morning w/ almond milk, plain greek yogurt, and Sunwarrior protein powder..I haven’t eaten my breakfast that quickly in a long time! Pumpkin pancakes are my favorite kind of pancake! Can I ask a random question? What site do you use to get that nutrition label? I use sparkrecipes recipe calculator but whenever I try to paste the label into my blog it doesn’t format correctly and loses the table. I used caloriecount.com and just took a screen shot with a snipping tool on my computer, saved it as it’s own image and then inserted it into the post. I just made these (kind of!) and they were like dessert! I thought i had some pumpkin but found out too late I didn’t, so I subbed some softened almond butter and used greek yogurt instead of the cottage cheese. Looking forward to trying pumpkin next time, but these were really tasty with the almond butter too :) thanks! These were delicious! I used oat flour and a chia/flax “egg” and they turned out great. Thanks! These sound delicious! I’m going to try them! :) were the nutrition facts for 1 out of 6 pancakes? This is the BEST pancake recipe I have found! Thank you thank you thank you! I was just about ready to give up on a healthy pancake recipe! I’m so making these ASAP!!! Thanks for sharing! I just made these this morning after a rough workout last night. LOVE them!! Thanks for sharing! Can you substitute arrowroot flour or tapioca starch in place of the flour? 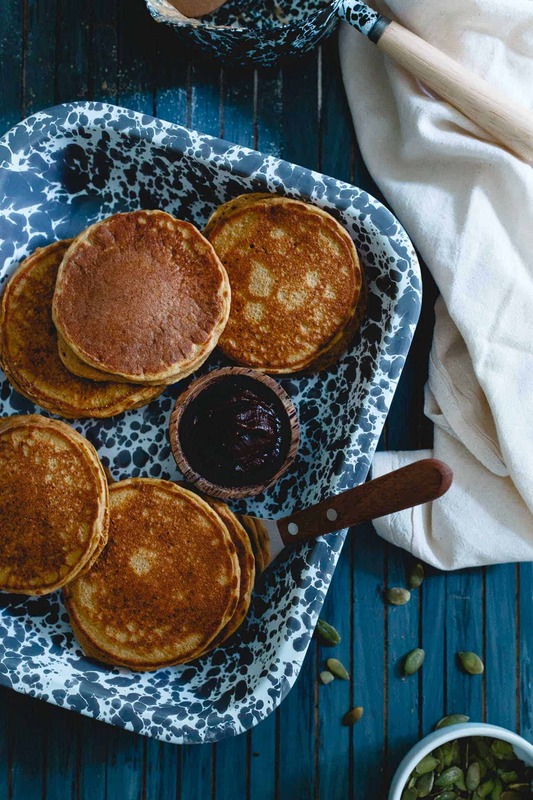 Pumpkin pancakes are the epitome of a perfect fall breakfast! Love that these have added collagen! I’ve been wanting to try collagen peptides so badly! And please, where is that beautiful blue flecked, wood handled pot from??? These look SO delicious!! Do you think I can use regular whole wheat flour? pastry flour is a bit finer than regular whole wheat. Whole wheat white flour would be a fine substitution. Regular whole wheat might require a little bit more wet ingredients, just add some more milk if necessary. YOUR RECIPE SAYS “YIELDS 2 ” ……….. 2 PANCAKES ??? ………….. 2 SERVINGS ??? A REVIEWER ASKED IF THE NUTRITIONAL PROTEIN VALUE WAS FOR ONE PANCAKE … YOU SAID FOR ALL OF THEM. HOW MANY IS ALL OF THEM ??? I’m so confused– people in the comments keep mentioning cottage cheese/greek yogurt. Am I totally missing something? ?